Water should be your primary beverage. Aim for 8-12 cups daily. Avoid sugar sweetened beverages and juices. Use caution with artificial sweeteners and sugar substitutes (100% stevia is best option), as they cause an insulin response, resulting in inflammation. 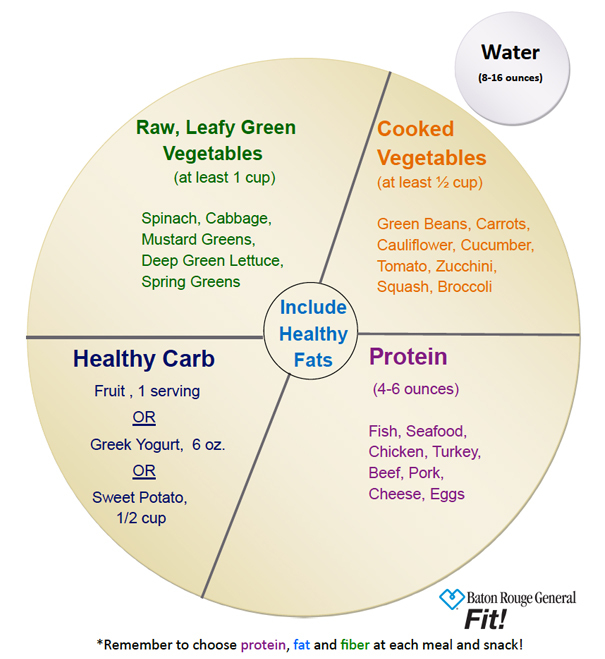 Choose Protein, Fat and Fiber at each meal and snack. The best protein sources are from animal sources and include poultry, beef, pork, seafood, cheese and eggs. Avoid fried and breaded meats, as well as preserved meats. To properly absorb the fat soluble vitamins A, D, E and K, there must be a fat source present in your meal. Be sure to include healthy fats such as olive oil, coconut oil, nut oils, nuts and nut butters, and seeds. Remember to choose butter instead of margarine to limit trans-fat, and avoid processed oils such as vegetable oil, soybean oil and canola oil. The healthiest, most nutrient-dense carbohydrates include fresh or frozen whole fruits and vegetables, Greek yogurt, and sweet potatoes. Avoid grains, legumes, milk, sweets, and starches, as they result in elevated blood sugar, and possibly intestinal inflammation. Avoid fried foods as much as possible. The high temperature used to deep fat fry denatures oil, which can lead to inflammation. Always read the ingredients list on food labels. If you cannot pronounce or identify an ingredient, you shouldn't eat the food. And remember to look for a short ingredient list.